Well, here we go into what is perhaps the most infamous arc in the franchise. There are no two ways about it: Frontier's Royal Knights arc is irredeemably terrible. It's unfair to blame it for sending the franchise into its dark ages as the decision to hold off on a season five must have been made long before these episodes aired. Even so, and even despite a solid conclusion once Lucemon wakes up, this stretch takes a series that was already languishing behind the others and buries it. Prior to this, the series had enough going for it that somebody could make a reasonable defense about its merits compared to the first two seasons (anyone trying to stack it against Tamers is fooling themselves). By the time this is over, the entire season will be tainted. There will be plenty of time to discuss all the failures involved here, and we'll certainly be fishing for things to talk about, so there's no reason to delve into it now. Besides, there's actually plenty to like about this particular episode. In fact, it's exactly how a new arc should begin. The good guys recognize that something's still not right despite their victory, a strong presentation reveals why, and a new enemy shows up and nearly destroys them. At the same time, however, it exposes one of the arc's greatest faults by flat out telling us exactly what is going to happen in it. Baromon, considering his limited expository role that has very limited potential, is pretty awesome. He respects the legacy of the Legendary Warriors, yet isn't afraid of them or their initial threats against him. Instead he calmly stops them and uses this tunnel of history place to delve just a little bit deeper into the mythos. Bokomon, for his part, does well to make sure Baromon skips over old information, cutting straight to the important updates. In particular, the reminder that Lucemon was merely sealed away and the news that Cherubimon was supplying data to Lucemon to spur a future rebirth. With him gone, Dynasmon and Crusadermon are abandoning all pretense and making it clear what they're doing and why. 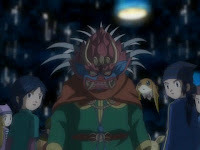 Along with outlining the past, Baromon does a great job outlining the future. He predicts that the Royal Knights will be successful and that Lucemon will be reborn. 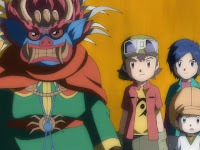 Perhaps we were supposed to believe that the digidestined were destined to prove him wrong or something. Nope! That's exactly what happens, only you have to wait another eight episodes for it to play out! Honestly, it's been telegraphed pretty much since the beginning that the kids would be fighting Lucemon at some point. 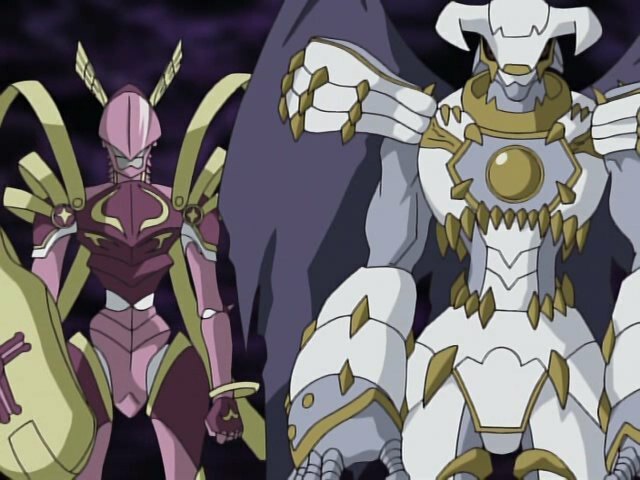 This prophecy, if anything, makes it seem like this Royal Knights business would be short, Lucemon would be coming back soon and the last few episodes would be some unforeseen final boss that is even stronger. Predictably, the kids persist despite Baromon's pleas to give up and go home. They're confident that they can meet this challenge. So confident, in fact, that their initial defense against Dynasmon and Crusadermon consists of the two Hybrids and four human spirits. Yeah, Kazemon vs. Crusadermon actually happens and it goes about as you'd expect. Dynasmon and Crusadermon may be giving off an even bigger Team Rocket vibe than Arukenimon and Mummymon did (they even led off with a motto! 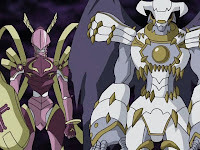 ), but they are a very functional team, using some pretty nifty techniques like Dynasmon using an opening in his battle to attack Crusadermon's opponents. If it weren't for Dynasmon going all Honeymooners and blasting everything to the moon, I'd even say they were competent. Baromon, for his part, carries his role to its logical conclusion. After the digidestined go off and fight anyway, Baromon marvels at their strength, even reaching the point where he thinks they might have a chance. He's so impressed that he sacrifices himself in order to save them, which was oddly predictable but appropriate nonetheless. Given what we've got in store, he picked a good time to go out. We'll go more into depth on this down the road when we're fishing for topics, but we are going to have to stick with the name Crusadermon and the assumption that she's female. As these reviews strictly concern the dub (and nothing is more irritating than comments using something from the Japanese version to present a dissenting opinion), I'm usually not apologetic about incorporating such changes. Frontier, after all, is full of them. But the RhodoKnightmon/Crusadermon swap is a black mark, and the last thing this arc needed was a narrow-minded dub change. With the gang in the Continent of Darkness for so long, we haven't seen the full devastation of the world in a while. This is our first glimpse of how bad things have gotten, and it's so rough you almost want the kids to throw in the towel rather than try to save such a mess. As feared, while the process of surrendering spirits to Takuya and Koji was appropriately treated as a big deal last episode, it's already old hat when they do the same thing here. In a series that likes to bang significant plot points over the head, the failure to call out the fact that Koichi did not produce a fractal code was very well appreciated. Sometimes it's nice to have to do the work ourselves and speculate on what it means. I was always totally confused since I never watched the english dub, but the german dub, where the cast left Crusadermon being a male and someone told me leater Crusadermon is a female since the dude watched only the english dub. That's what pretty much got on my nerves. Want to hear something worse? In the german dub, they gave Lucemon a FEMALE voice. Sheesh, the Knights even called HIM MISTRESS LUCEMON. Worst german dub change ever! Why? I find Lucemons german voice actor absolutly perfect fore the role. And where is the problem with calling Lucemon mistress? Her voice is one of the reasons why she is one of my favourite Villains in the Series. Yeah in her fall down mode she is maskulin but with her heair and the fact that she is a monster and not a human I find it not unfitting in the slightest. I actually went ahead and calculated the GPA for all of the Frontier episodes up to this point (give or take some mathematical error on my part and using a hard 4-3-2-1-0 system). Episodes 1-37 of Frontier clock in at 2.81, which is barely above 02. It's a shame that I'm pretty sure the Royal Knights arc is going to drive it so low that only Hunters stands a possible chance of ever getting lower. Alas, I personally enjoy Frontier for a ton of reasons...but this is not one of them. And ah, I'm sorry for double commenting - but I should probably mention that this calculation does not include the movie. "... the RhodoKnightmon/Crusadermon swap is a black mark, and the last thing this arc needed was a narrow-minded dub change." Even if the reasoning wasn't exactly admirable, I do think the dub voice suits Crusadermon's appearance better, overuse of the word "beautiful" notwithstanding. Never mind that it results in a female villain - a rarity in this series - I think it works mainly because it presents a foil to the more masculine and impulsive Dynasmon. Also, compared with the voice given to the Data Squad version, I think it's more authoritative and easier to take seriously as a normal speaking voice, which is always a good thing in a competent villain. In any case, I wouldn't call it a black mark. I think it actually improves the character.